LOUISVILLE, Ky. (AP) No. 4 Louisville accomplished a major goal on Sunday, but the Cardinals know they still have work to do. Asia Durr scored 20 points, and the Cardinals claimed their first regular-season conference title in 17 years with an 81-49 win over Pittsburgh. Louisville (29-2, 15-1 Atlantic Coast Conference) never trailed and cruised to its fourth straight victory and eighth in nine games. The Cardinals led by as much as 34-14 thanks to the hot shooting of Durr and Myisha Hines-Allen, both of whom scored 12 points in the first half. Hines-Allen finished with 18 points and 16 rebounds for the 43rd double-double of her career. Louisville and No. 5 Notre Dame both finished the season with a 15-1 conference record. Because the Cardinals beat the Fighting Irish 100-67 on Jan. 11, they will receive the top seed for next week’s ACC tournament in Greensboro, North Carolina. The last time Louisville won a regular-season conference title came during its tenure in Conference USA. While the Cardinals have advanced to two NCAA championship games, playing in the Big East and American conferences with Connecticut kept them from winning a title, as did Notre Dame when the Cardinals moved to the ACC for the 2014-15 season. Coach Jeff Walz said he pushed this team a little harder than previous squads because of the opportunity to win a title. As a result, he said he’d give them a little more time off before preparing for the conference tourney. Neither he nor Hines-Allen expects this to be the climax for the season. ”We’ve got more business to take care of here,” Hines-Allen said. The Panthers (10-19, 2-14) used a 10-2 run midway through the third quarter to get within 12 points, but Louisville ended the period on an 11-1 run to put the game away. Durr, who entered Sunday as the leading scorer in ACC play, ended the run in spectacular fashion. With less than 3 seconds left, she took the inbounds pass from three-quarters court, took a couple dribbles and put up a fadeaway 3-pointer from the corner. The shot swished as she fell off the court. It fired up an already intense crowd and Durr’s teammates raced off the bench toward her to celebrate. ”When they play with emotion like they did today, they’re even more dangerous,” Pittsburgh coach Suzie McConnell-Serio said. The Panthers lost their sixth straight and 10th of 11. Yacine Diop led them with 18 points, and Jasmine Whitney added 16. Sunday was Senior Day at KFC Yum! Center and before the game, Louisville honored Hines-Allen, the team’s lone senior. As she walked out with her family and received a framed jersey and flowers, the crowd of 10,431 gave her an extended standing ovation. More applause came during the game as the school played video tributes to her from fans, and she got another standing ovation and hugs from Walz and the team when she left the game for good with 3:03 left. After the game, she held up a sign to the fans touting the title, and when the ladder came out to cut down the net, the New Jersey native was the first one to climb it and snip off a piece. She wore the net around her neck during her postgame news conference. Hines-Allen ranks high on several all-time statistical lists. Her layup with 5:37 left in second quarter allowed her to pass Nell Knox (1,899 points) for third all-time in scoring for the Cardinals. While Hines-Allen still hopes to have a few more games in a Louisville uniform, her teammates know her future after this season is bright. 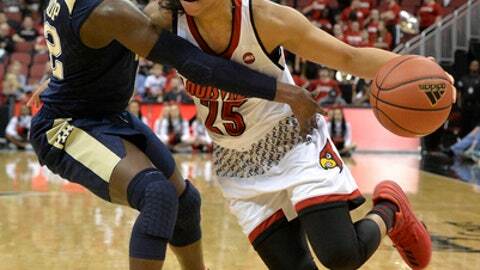 Pittsburgh: The Panthers, the worst rebounding team in the ACC, saw that weakness exploited by Louisville. The Cardinals out-rebounded the Panthers 40-24, with 14 of them coming on the offensive end. Louisville: The Cardinals have had some trouble getting off to strong starts lately, but that wasn’t the case Sunday. Louisville, which shot 52.4 percent overall, made nine of its first 12 shots and led by as many as 12 in the first quarter. ”I thought we moved the ball much better,” Walz said, noting the team’s 22 assists on 33 baskets. Durr finished with a game-high six. Pittsburgh: The Panthers will begin conference tournament play on Wednesday. The game time and opponent have not yet been announced. Louisville: The Cardinals earned a double bye and will start play in a Friday afternoon quarterfinal.